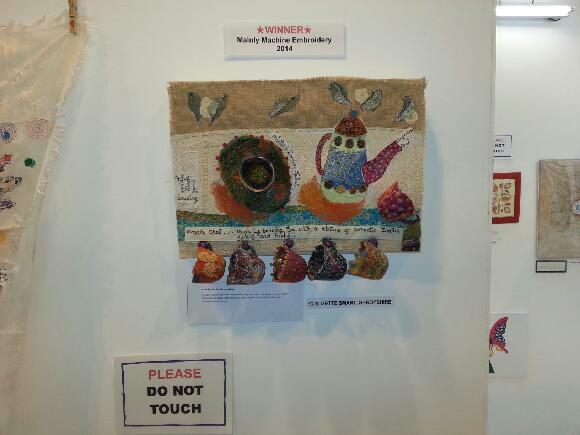 As a member of the Oswestry & District Embroiderers` Guild, I have these three recent works on show @ The Qube, Oswestry this month as part of our group exhibition. We will also have on display, pieces from the Guild collection. The exhibition runs from the 7th August to the 8th September. The Masala Chai inspired embroidery (below) which led to these pieces, can be seen in the current issue of Stitch Magazine. I haven`t just been on a tea trail though, I have a whole aviary of stitched birds to soon go on show too! More info to follow. This entry was posted in cups and saucers, The Embroiderers Guild and tagged embroiderers guild, Glimpses of India Competition, nice cup of tea, Oswestry, textile atrtist, The Qube by suzette smart. Bookmark the permalink.